O Templo do Tribunal was a religião nativa dos Dunmer de Morrowind. Eles adoração os deuseus-vivos Almalexia, Sotha Sil e Vivec, conhecidos como o Tribunal ou Almsivi. A maioria das pessoas geralmente os chama apenas de "o Templo". Eles aceitam estrangeiros como membros, mas a maioria dos poucos que se juntam, o faz apenas pelos serviços prestados. Em Vvardenfell, o Distrito do Templo includes a cidade de Vivec, a fortaleza de Ghostgate, e todos sagrados e profanos sítios, (incluindo áreas sob o Blight dentro da Ghostfence) e todas as não colonizadas e selvagens áreas, como o Armistício com o Império manteve a ilha preservada ao Templo. Na prática, tal distrito inclui todas as áreas de Vvardenfell que não sejam reivindicadas por Redoran, Hlaalu ou Telvanni. 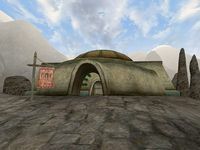 O Templo maintains relações abaixo do considerado favorável com a maior parte das guildas Imperiais de Morrowind. Entretanto, maintains relações próximas com a piedosa Casa Indoril e Casa Redoran, e is amigável com as Casa Dres e Casa Hlaalu. Of the Great Houses of Morrowind, House Indoril is the one most deeply rooted in the Temple hierarchy, dominating both the priest caste as well as the Ordinators, who serve as guardians of the Temple. House Redoran is one of the most pious houses; Redoran Buoyant Armigers serve together with Ordinators as guardians of the Ghostfence and the Tribunal Temples. House Hlaalu, being dominated by Imperialised Dunmer, prays when it is convenient, maintaining the appearance of piety through lavishly-appointed structures. House Telvanni has little use for the Tribunal Temple, as the Magelords themselves are as ancient as the Almsivi, letting its temples become overrun with dust and squatter merchants. House Dres, being the most traditional of the Great Houses, supports the Temple when it is convenient for their slave trade. Tribunal Temples are scattered all around Vvardenfell and most serve as return points for Almsivi Intervention spells. While many of the temples in outlying areas are freestanding structures built of packed mud in the Redoran style, it is not uncommon to see them adapted to blend in with local styles, be that built on top of Vivec's cantons, or even integrated into Telvanni mushroom structures. Patriarch doesn't actually require those skills/attributes, as the final promotion is automatically given from the final Temple quest, Ebony Mail. Esta página foi modificada pela última vez à(s) 08h09min de 21 de março de 2016.